Beston Group are paying a visit to Malaysia from 14th to 21st August, 2018! The business person in this visit includes Ms. Anne, Mr. He, Mr. Li, and Mr. Xu. They will help you to solve problems in your mind. Of course, it is available for you to contact them in advance! Beston Machinery mainly offers three types of green machines for customers, including pyrolysis machine, carbonizing machine and waste sorting machine. We hope more Malaysia customers will have a deeper understanding about Beston machine and shape a long-term cooperation with us through this visit. At present, maybe you have some question about production process, raw material or machine cost. Don’t worry. Beston business person will solve all of your puzzle at the scene. Accordingly, email us right now to get more information! 1. Tire recycling machine. Do you know the method to convert the waste to oil? The answer is adopting this kind of machine. This machine adopts advanced pyrolysis technology. Besides of tire, plastic, rubber, medical waste or oil sludge also can be regarded as the raw material. We all know these waste cause severe environmental pollution for our life. Application of this machine will bring many benefits to our planets. 2. Biochar production machine. This machine can carbonize all sorts of waste biomass, such as coconut shell, peanut, rice husk, bagasse, wood, bamboo, palm kernel shell, oil sludge, etc. 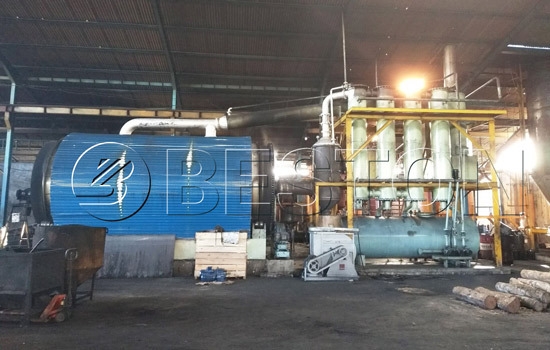 Due to the updated design, Beston charcoal making machine has various advantages, such as high efficiency, superior quality, reasonable price, safety design, energy conservation, etc. 3. Garbage sorting machine. This machine classifies the waste into different types, such as plastic film, organic matters, metal, sand and stones, etc. Then sorted waste can be recycled as resources. Wide application of this machine will reduce a large amount of pollution around us. The aboving machines all have small scale and large scale to satisfy your different requirements. If you have an interest in Beston machine, email us as soon as possible. We do believe you won’t regret to choose us!